RUD sling and lashing systems guarantee safety when lifting and moving loads. Over 550 different innovative tested lifting/lashing points (welded or bolted) meet the highest demands in all areas of lifting equipment. Elko Wire Rope provides manufactured rigging products and hardware which are competitively priced and delivered on time with zero defects at quality and service levels that are consistent with the expectations of the customers. 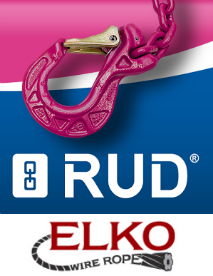 MSM Group is proud officially sale RUD Sling & Lashing System and ELKO Wire Rope rigging rope and slings in Mongolia. For more please call +976 7718 1111.